Apart from two albums, each of the albums contained a story told throughout the songs; some stories span more than one album. Only Fatal Portrait and The Spider's Lullaby deviate here, in that only four of the songs form a story while the other songs are independent. His extremely high falsetto vocal style is notable. King formed the band in Copenhagen, Denmark along with two former Mercyful Fate members, guitarist Michael Denner and bassist Timi Hansen and was joined by new drummer Mikkey Dee. The original second guitarist Floyd Constantin was soon replaced by Andy LaRocque. The band debuted with single No Presents For Christmas, followed by debut album Fatal Portrait. 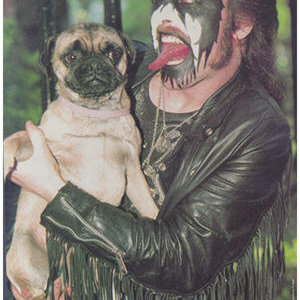 King Diamond would also play some Mercyful Fate songs on gigs. The second album Abigail was the first full concept album. Shortly before the release and following tour, Michael Denner left the band. His replacement was Mikael Myllynen, who also appeared in band's first promo video, The Family Ghost. However, he left the band after the tour. The remaining quartet (with King as guitarist) demoed songs that would later appear on "Them" album. The new members to record the album were guitarist Pete Blakk and bassist Hal Patino. Timi was officialy out of the band, but he taught Hal the bass lines. Second music video was Welcome Home. Around this time, King was sued by Kiss' lawyers, that his make-up was a copy of Gene Simmons' demon and that he also copied Kiss' show on his gigs. Mikkey Dee left the band, but as King couldn't find a good replacement, he recorded drums for Conspiracy as a guest. The following tour then featured Snowy Shaw. Another music video was made, this time for Sleepless Nights. However, he did not play on the next album The Eye (a drum machine was used), though he was credited. Meanwhile, live album In Concert - Abigail was released. Both Pete Blakk and Hal Patino were sacked from the band and were replaced by Mike Wead and Sharlee D'Angelo. his line up was supposed to record the following album The Spider's Lullabye, however, King focused on Mercyful Fate's reunion. The new album was recorded by entire new line-up (except for Andy and King), that featured guitarist Herb Simmonsen, bassist Chris Estes and drummer Darrin Anthony. The same line-up would remain also for two following albums The Graveyard and Voodoo, only on the last one Darrin is replaced by John Luk? Hebert. During this time, King sings both with Mercyful Fate and King Diamond. On the tour, Mercyful Fate is a support band for King Diamond, and King uses a different make-up for both bands. The band then replaced Simmonsen and Estes by Glen Drover and David Harbour and recorded House of God. At the time, King Diamond & Black Rose 20 Years Ago (A Night of Rehearsal) was released. Although released as a part of King Diamond discography (borrowing also the band's logo), it was actually an old rehearsal recording of King's first band Black Rose. The following album Abigail II: The Revenge was the first to be recorded by the current line-up. Both Hal Patino and Mike Wead returned and a new drummer Matt Thomson joined. For the following album The Puppet Master, the band hired a backing female vocalist Livia Zita, whom King married. Another live album was released, Deadly Lullabyes: Live. The last studio album Give Me Your Soul... Please was accompanied by music video for the title song.